Highlights from our 2018 annual conference! Two days, 360 delegates and 89 speakers debating and discussing the contradictions and challenges we face working in global health and the innovative and inspiring ways health partnerships are working to tackle these: our 2018 Annual Conference provided insight into the enormous strength and power of global health initiatives. Top ministers and leading practitioners from the world of global health gathered at the UK’s biggest Health Partnership event to debate the challenges and responses to global health issues and how the UK is contributing to the attainment of Universal Health Coverage (UHC). Prolific speakers including, the Chief Medical Officer for Scotland, Dr Catherine Calderwood, Director of the Institute of Global Health Innovation at Imperial College, Professor the Lord Darzi and a video message from the Director General of the WHO, Dr Tedros Adhanom Ghebreyesus, gave the global health and development community an opportunity to discuss how health partnerships can improve healthcare abroad as well as at home as the NHS celebrates its 70th anniversary. This year, as you know, marks the WHO’s 70th birthday and as you know it is also the 70th anniversary of the National Health Service. Both the WHO and the NHS were founded on the conviction that everyone everywhere must have access to affordable quality healthcare. But today more than half of the world’s population lack access to essential health services and almost 100 million people are pushed into extreme poverty every year by the costs of paying for care out of their own pockets. Innovative partnerships can help address this injustice by tapping global experience to find local solutions. Partnerships are the only viable way to train health workers and boost health systems, few countries can go it alone. Best practice, innovation and the ethics of volunteering within the health partnership community were also furthered as the conference saw the announcement of the Commonwealth Partnerships for Antimicrobial Stewardship Project announced, a welcome and much celebrated commitment from the UK government as part of the wider work of the Fleming Fund. Students form the next generation of doctors, nurses, midwives, innovators, researchers and global health champions and this Toolkit pays tribute to the students from across the UK who have already taken part in global health work. It also forms a call to action, we could be doing much more for this which in turn will benefit both students , their counterparts and those most in need. The Conference was closed by Professor Sir Eldryd Parry, THET’s Founder and Lord Nigel Crisp, Co-Chair of the All Party Parliamentary Group for Global Health who spoke in conversation of their beginnings in global health and both the barriers and great advances they have experienced whilst working to bring about equitable health services around the world. 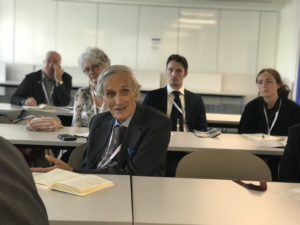 Over two days, the conference brought to bear the need for partnerships, research and programmes to combat the continually growing health inequalities, whilst highlighting the continued and growing contribution the UK is making to combat this. 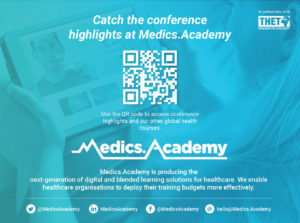 For further information on the Conference and exclusive content please visit: https://www.medics.academy/bundles/the-medics-academy-global-health-bundle or scan the code below! I have email addresses of a number of BSc Nursing and Midwifery students in Lira Uganda, who would love to link in with UK students. If there are any nursing students who would like to link in using whatsapp, please let me know.